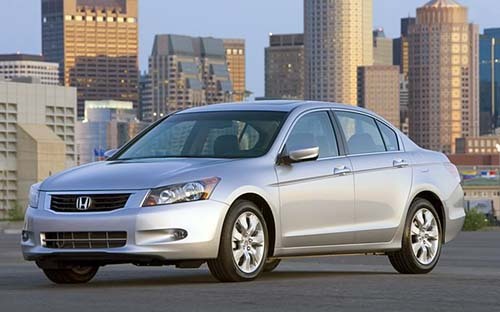 When Honda set out to redesign the Accord, which was one of the largest-selling cars in North America, it needed to not only build on its strengths and appeal to loyal customers, but also keep up with the technological progress made in the industry and try to entice new buyers into the fold. It’s a lot simpler to say than to do, but that is what faces any mass marketer of cars these days, and Honda was no different. The new eighth-generation Accord offers more of everything people want in a mid-size sedan, and adds a higher level of something it hasn’t been accused of having in great amounts – emotion. Actually, the last-generation coupe was sporty and so is the latest version, but the new sedan is much more stylish and aggressive than the last version, which actually had to be restyled in mid-life. It is in the currently fashionable design idiom, with a swooping character line not far below the belt line being its most prominent feature, along with the biggest grille since the early days of Accord, reminiscent of the Ridgeline truck. It’s a departure for Honda, and we’ll see soon enough if people like it. There is little doubt they will like the rest of the package, as it is larger inside (and out), more fun to drive, and better equipped. Under the hood, as before, are four- and six-cylinder engines, all more potent and frugal than in the ’07 Accord. The base LX model gets a 2.4L four with 177 hp, while EX and EX-L models get the same engine pumped up to 190 hp. The latter might make you forget there is a V6 available, so refined and powerful is it. But there is, indeed, a V6, now with 3.5L and 268 hp, and Variable Cylinder Management (on automatics only) that allows it to run on three, four or six cylinders depending on conditions. Transmissions are five speeds, manual or automatic, except for the six-speed manual in the V6 Coupe. Front suspension is double wishbone, while the rear is multi-link, and the settings are more firm than previously. The rack-and-pinion steering uses a new Variable Gear Ratio system that turns the wheels quicker with large steering inputs. Brakes are four-wheel disc with anti-lock on all models. Also standard across the board is electronic Vehicle Stability Assist and a Tire Pressure Monitoring System. You should be getting the impression that Honda has cut no corners in producing a family sedan that is not only responsive to drive, but incorporates all possible active safety features. Passive safety features include a stronger body structure with new energy-absorption technology, front, side and all-row curtain airbags, and active head restraints. With increases to every exterior dimension, it is easy to see why the Accord sedan’s interior is commensurately larger as well. In fact, it is now the largest of any Asian-branded mid-size sedan, and classified as a “large” car in the U.S. Space is one thing, but comfort depends so much on seats and ergonomics, and both are exemplary. The front seats are broader and more supportive where they ought to be, with bigger side bolsters. The driver’s seat is height-adjustable, and that, along with a greater range of tilting and telescoping in the steering column, yields a better seating position for more drivers. The 38 mm-wider interior allows the front seats to be positioned further apart with a 70 mm-wider centre console. And there is 76 mm more knee room in the back seat of the sedan. So, the Accord is roomy and comfortable, but it is the overall look of the interior that really impresses, and it could be said that this will be the Accord’s trump card in the showroom. Honda has created a very classy environment that, especially in the upscale EX-L guise, might make one wonder why one needs to spend $10,000 more on a near-luxury car. Comfort, convenience and infotainment equipment depends on the model, but it includes such technology as Bluetooth Hands-Free Link, voice-activated Satellite-Linked Navigation System, premium audio system, XM satellite radio, MP3 with auxiliary jack, and Active Noise Cancellation, which registers low-frequency noise in the interior and emits a “reverse phase” audio signal through the speakers to cancel it out. All this in a mid-size family sedan! Honda’s goals for the Accord are two-fold. It will regain the number one sales position in mid-size sedans in Canada with 28,000 units the sales goal, which means it will have to rise from 20,000 units, and pass Camry and Altima in the process. And it will do nothing less than redefine the mid-size segment, adding emotional appeal to the usual rational considerations. Lofty goals, indeed! Does Honda have the car to do it? With the best overall performance and the roomiest and nicest looking interior in the segment, aggressive new exterior design, and a full range of technology, the Accord makes a strong case.